Even though cancer is no laughing matter, one needs some upliftment when it strikes you or someone close to you. Being the funny person Drescher is, and able to reach countless people with her story, I felt I had to review this book, even though it was published three years ago. 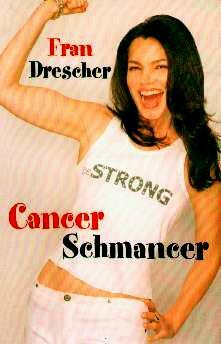 She doesn't make light of this serious affliction, despite the title, Ms. Drescher not only tells us what she experiences (now we know what to look for) but what she went through. She also writes about her life so it's a multi-level look at her life. As we get older, things in and on our bodies change and some changes can be alarming. Upon reading her story, I felt rather afraid as I am having the same and similar symptoms, also to be told my blood tests were fine, as were my hormone levels, and that all was well. Not having any medical insurance I couldn't go and see nine different doctors like Ms. Drescher. At the insistence of her sister, a nurse, she got her surgeon to do a biopsy which showed that the "baby cancer" she'd finally been diagnosed with, was now found to be cells that were grades three and four and that a radical hysterectomy was necessary. Surgeons and doctors, like everyone else, are not infallible and they went ahead and removed her appendix at the same time the hysterectomy was done. This Fran only discovered when she woke up. Then she discovered she was given too high a dose of morphine in her I.V., lessening her breathing. All this on top of being in a new relationship after being married for about 20 years. The website for women's cancer is: www.wcn.org if you'd like more information. I loved the book and it jolted me into thinking seriously about the changes I am experiencing with my body. Conclusion - A must-read for all women experiencing one bodily change or another. I'm going to do what Fran did - maybe I'll finally find out what the matter with me is.